THE BEST PHOTO i ever took was a snapshot: i was in a museum with someone whose name literally translated means "wisdom", and when he wasn't looking i photographed him disregarding the painting "Madonna mit dem Veilchen" by Stefan Lochner from ca. 1440. he is standing in front of the gold-framed, life-sized painting of mary who is holding the child in her arms. resting on one leg he's caught in a moment of almost weightless balance, slightly at odds with the horizon created by the meeting of wall and floor. even though his face is turned away from the camera it is apparent that, instead of looking at the picture, his glance is lost in the distance. his grey trousers and sweater match the color of the wall and the folds in his clothes fall as elegantly as those of mary's garments in the painting. in that moment i took the photo i was asking myself how it must feel for him to be in a building full of art whose iconography was entirely grounded in christian mythology and biblical images - something he didn't know a thing about because he came from a totally different cultural background. and suddenly i had this image in my head of a fourth magi, the one who lost his way, the one who never found the manger and wandered around aimlessly with his presents for two thousand years, majestic but homesick, forgetting - while the centuries passed - what he was looking for and accidentally ending up here in cologne, the place where the relics of the other three are buried in the cathedral. 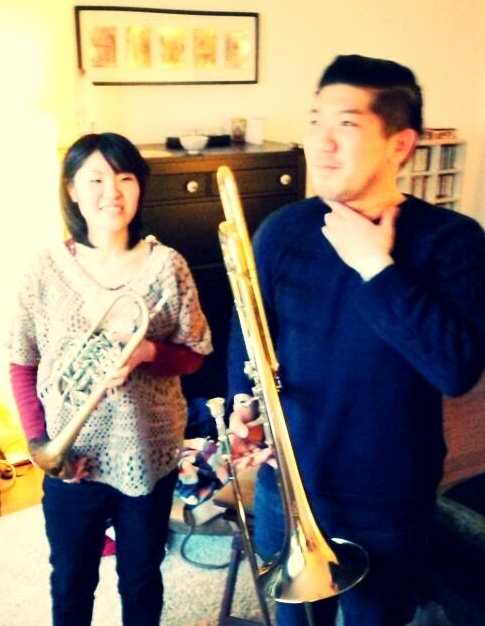 Naruhiko Shigeta and Ayano Miyajima recording the horn section.